I love gyoza! Whenever I go for Japanese these are first on the menu, and I’m absolutely into a bit of a dimsum blow out once in a while. Teeny tiny parcels of joy. We started making our own gyoza the other year, after a night out where my boyfriend and I both admitted that all we wanted was the gyoza starter x 3, each, for dinner. Now, when we fancy them we whip up a quick batch and serve with edamame. Perfect. 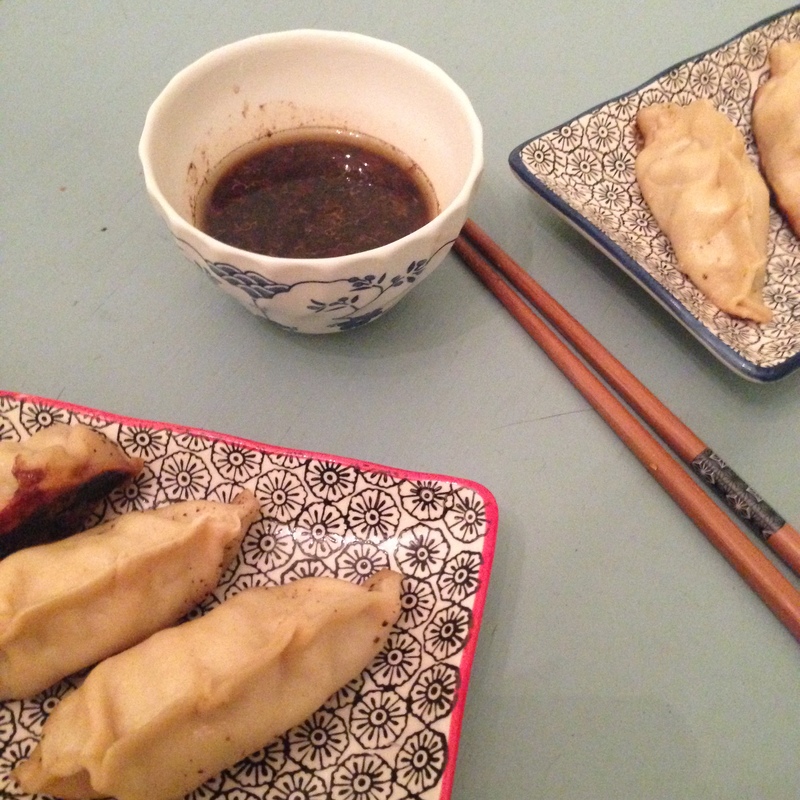 Gyoza are really simple to make, but there is a bit of prep time involved. However, if you make follow the recipe below you’ll make enough filling for two-three meals (for two people). Then when you want them you just need to defrost the filling and make up the little parcels. Easy! You can either buy your wraps from a local Asian supermarket, or make your own. Depending on how clean you want to go, you can use white, wholemeal, or almond flour for these. The trick is to roll them as thin as possible. In a food blender, add the cabbage and spring onions. Blend on high till the cabbage is chopped fine. Add in the meat, and seasonings. Blend together. Add the flour and salt to a small bowl. Add the water slowly, mixing together with a chop stick (Iess for the dough to stick to!). You want the mixture to become doughy – pliable but not wet. Knead together. Roll the mixture out as thin as you can (doing in batches is easier). Using a cup or cookie cutter, cut the dough into 3 inch diameter circles. Leave on the side till you’re ready to make them up. Mix the ingredients together and use for dipping the gyoza into! Spoon a small amount of the mix into the centre of the wraps. Fold the wrap up so the edges are touching each other. Using your finger, wet one of the inner sides. Press the other side to the wet edge and squeeze together. Work your way from side to side, folding the edge slightly back on itself to make the gyoza shape. Lie on its bottom so you get a flat edge. Get a thick bottomed pan with a lid. Cover, and turn the hob on high. Once the pan is hot, place your gyoza inside. Fry the bottom for 2-3 minutes until they start to go crispy. Add a dash (1/16th of a cup!) of water to the pan, and cover quickly with the lid. Turn the heat off and steam for 10-12 minutes.